Longlin House is just 3 blocks from the riverside, 2 blocks from the National Museum and Royal Palace. At nighttime, the popular 172 Street, 51 Street crossroads with clubs such as Pontoon and Heart Of Darkness is within a 5-minutes walking distance. Longlin House features AC and fan rooms for single, double and multiple occupants as well as dormitories for the budget traveler. 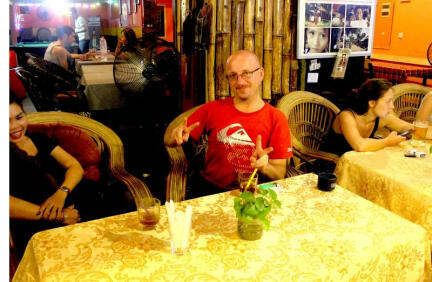 Longlin staff is well experienced in booking further on travels within Cambodia or in Asia. Motorbike rentals, tourguides and so forth. Also laundry services are self understood. The pool billiard and restaurant area is most popular not only with guests, but also with expat foreigners, other tourist and Khmer population with a generous happy hours from 4pm to 9 pm (Draft beer only $ 0.50, Free beer with Pizza or burger). For breakfast start form $ 1.50 include drink and for lunch from $ 2.00 also include drink. 5. Age Restriction: The minimum age of guest is 1 year old.